Since the first printing of Life, Money & Illusion, there has been little improvement in the relationship between people and the Earth. There has, however, been a great deal of change in how people see that relationship. In 2006, as we began our first Living on Earth as if we want to stay tour with book in hand, Al Gore's movie on climate change, An Inconvenient Truth, was starting to circulate. As public awareness of that problem grew, it was easy to show how increasing carbon dioxide in the atmosphere demonstrates the maturation of the human species. It proved to be a good introduction to our tour theme. Concern about climate change was at an all time high when it was eclipsed by concern for rising oil prices. Globally, we were consuming petroleum almost as fast as it could be produced. While much oil remains, when it can't be pumped as fast as people want to use it, different interests bid against each other to get what they need. Speculators, seeing the oil peak coming, bid the price up to a record $147 a barrel in July of 2008. As the human family touched the planetary limit of oil production, concern over the price of gas also drew attention to our message. Then everything requiring energy to produce started to rise in price and inflation became an issue. As discussed in Chapter 9, standard policy for resisting inflation is to raise interest rates. Rates were indeed raised, triggering another problem that quickly overshadowed the issues of both climate and fuel prices. The unintended effect of the higher interest rates was the collapse of the subprime mortgage boom. Subprime mortgages were housing loans made to people who could ill afford them. They were offered with no down payment required, no income check and, sometimes, no interest payments for an introductory period. When payments came due, at rates higher than anticipated, many could not pay. The shock continues to reverberate around the world. Why were hundreds of billions of dollars worth of mortgages issued to people who could not really afford them? The compelling circumstances date back to 1971 when then President Richard Nixon cut the link between the US Dollar and Gold, thereby decoupling all currencies. No longer tied to the material world, money was free to grow un-inhibited. This was an early indication that human activity had reached a planetary limit. The resulting problems, however, were scarcely apparent until 2001, when George. W. Bush went on national television, after the events of September 11, and instructed Americans to go shopping. You will come to understand the logic of this request, in the chapters ahead, as you read about the evolution of mutual provision (economics) - from the days of reciprocal service within families and small communities, to today's global economy. The short story is that, in our present debt-based economic system, money is created when banks make interest bearing loans. Such money must always be repaid in greater measure than was created, since the interest component is not created at the time the loan is made and must be gathered from money put into circulation by other loans. If more money is not loaned into existence each year than in the previous year, or if people hold onto their money, keeping it out of circulation, there isn't enough money available for everyone to pay their debts, plus the interest. When loans go bad, businesses fail, people lose their jobs and houses and the hard times of recession result. After 9/11, the future was unclear and Americans held onto their money, adding the danger of recession to their nation's woes. Encouraging Americans to go shopping was an attempt to get money circulating in sufficient quantity to avoid recession. Not enough people went shopping, so interest rates were dropped to almost nothing in the hope that enough money would be borrowed to keep the economy afloat. When response to the low interest rates was insufficient, subprime mortgages filled the void. Whatever a house cost, if someone wanted it enough to sign a mortgage form, that much money was created and went into circulation. The economy was saved - for a while. With the oil price shock and interest rate hikes in the Summer of 2008, however, the subprime mortgage bubble burst. Housing prices and a number of "financial instruments" based on the supposed value of those mortgages crashed. Indeed, enormous pyramids of wealth were found to have no basis in material reality. 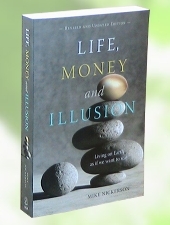 Life, Money & Illusion was originally written to clarify the nature of our species' maturity. The present economic turmoil adds evidence of economic maturity to the pollution and resources depletion that signal ecological maturity. This second edition of Life, Money & Illusion has been updated to include this crucial evidence. In question is the faith that growth everlasting is possible on a finite planet. Our present leaders still hold onto the Peter Pan view of eternal youthful growth. While money has long been scarce when needed for education or health care, trillions of dollars are suddenly available to try to reinflate the passing order. If the present leaders are able to pump economic activity back up to pre-crisis levels and get it growing again, watch for renewed confrontation with planetary limits. The sooner we acknowledge that what worked in the past cannot continue to work in the future, the sooner we can rise to the opportunity before us. We have the knowledge, the skills and the ability to enjoy living - all that is necessary to fashion a secure, balanced relationship with the Earth. May Life, Money & Illusion inspire you to find ways of advancing the great transformation that lies ahead. For other material added in the second edition see: Transforming Toward Sustainability, A Silver Lining to the Economic Downturn and Three Potent Steps to a Sane Economy. Materials even more recent than the 2nd edition are posted here.